The Visitor Center at Valley Forge National Historical Park is your entrance, not only to the Park, but to the Revolutionary history of Montgomery County. Open from 9 a.m. to 5 p.m. daily, 9 a.m. to 6 p.m. from mid-June through mid-August. The Visitor Center is a treasure trove of history. Large panels tell the story of Valley Forge, its causes and its results, while glass cases display artifacts from the encampment. 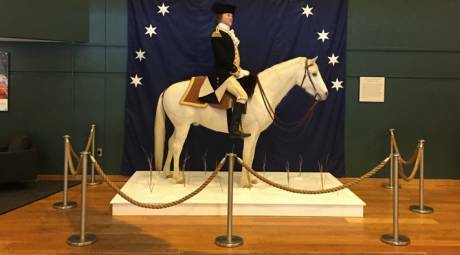 One of the highlights of the exhibits is the life-size statue of Washington on his horse. The park theater, located in the building next door, shows an 18-minute orientation film titled "Valley Forge: A Winter Encampment." 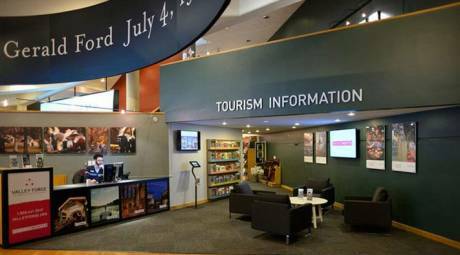 In addition to the exhibits and displays, the Visitor Center also provides tourism information for Montgomery County. Here the friendly staff will help you plan the rest of your trip by providing information on local hotels and restaurants, as well as other area attractions. Take home a piece of history from The Encampment Store. 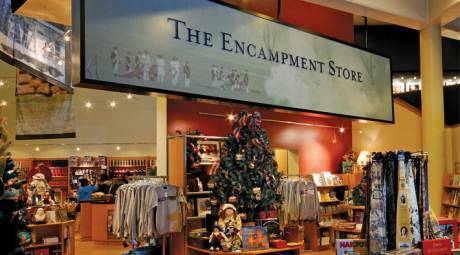 Located inside the Visitor Center, the Encampment Store provides gifts and souvenirs for the whole family, from neckties and coffee mugs to toy muskets and tricorne hats. Snacks and refreshments are available, and you can also purchase tickets for the 90-minute trolley tours here.